The National Security Agency may release transparency reports on the amount of surveillance it is doing, according to its deputy director. Speaking at the Ted conference, where leaker Edward Snowden spoke earlier in the week, NSA deputy director Richard Ledgett said Mr Snowden had put people's lives at risk. He said letting "the bad guys" know NSA's methods made them harder to find. But he said the agency should do more to reassure people about its work. He defended the Prism surveillance system, saying it was "hugely relevant" in disrupting terrorist plots. Mr Ledgett was beamed in to the Ted (Technology, Entertainment and Design) conference taking place in Vancouver via video link, in a similar manner to how Mr Snowden had appeared. He told the audience that he wanted to "inform the discussion with facts" rather than the "half-truths and distortions" he accused Mr Snowden of using. But, he added, the ex-NSA agent's exposure of its programs and practices had opened up a global debate about the "balance between secrecy and transparency", that the agency wanted to fully engage with. "There is a proposal to release transparency reports in the same way as the internet companies are doing," said Mr Ledgett. He admitted that the NSA needed to be more transparent about its processes, authorities and oversight. "We haven't done a good job on that," he said. But he emphasised that all the work the agency does has been rubberstamped by the president, federal judges and Congress. Of Mr Snowden he said: "It shows amazing arrogance that he knows better than the framework of the constitution." His release of vast amounts of top secret documents outlining the work at the NSA had been hugely damaging, said Mr Ledgett. "He put people's lives at risk. "If our adversaries see our methods they will move away from using them. We have evidence that terrorists, smugglers and nation states have moved away. We are losing visibility into what our adversaries are doing," he said. He said that the agency needed access to the global telecommunications system to monitor the activities of terrorists, traffickers and enemy states. "It would be great if the bad guys used a corner of the internet. If they had a domain badguys.com, that would be awesome," he said. "But we are all on the same network. I use the same email service as the terrorists. We need to be able to pick that apart to find what we need." Along the way it is inevitable that agents will "encounter people going about their business" but the NSA uses what he called "minimisation procedures" to ensure little information is read. And on the collection of meta-data, which shows when, where and who someone is communicating with, he said: "If you aren't connected to a meta-data target you are not of interest to us." The debate about mass surveillance has proved a hit at Ted, with packed audiences for both the Edward Snowden and NSA interviews. Mr Ledgett received a standing ovation from some but far more stood up at the end of Mr Snowden's interview. While most of delegates saw the leaks made by Mr Snowden as a positive thing, some questioned making him into a hero. "By doing that we encourage other young Americans to steal secrets," said one delegate. Astronaut Chris Hadfield, also a speaker at Ted, tweeted after the debate: "Thought-provoking" while Google co-founder Sergey Brin was seen in deep conversation with Mr Snowden, via the video screen, after his appearance. As to the fate of Mr Snowden, who said that he has been offered a deal by the US government, Mr Ledgett suggested this may be possible. "There is a tradition in American jurisprudence of having discussions with people who have committed crimes. There is always room for discussion." The tagline of Ted is "ideas worth spreading". 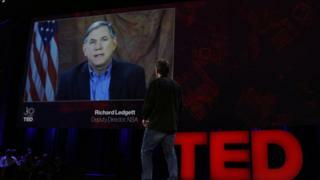 At the end of the interview, Ted curator Chris Anderson asked Mr Ledgett what his would be. "Look at the data," replied Mr Ledgett.